Tablet-maker Wacom and local distributor Renaissance Brands are touting the pen tablet Bamboo, for resellers to target customers who maximise Vista functionality. According to the Japanese vendor, the USB-powered Bamboo can turn any laptop or desktop computer into a tablet PC. The Bamboo is smaller and less expensive than Wacom’s Intuos and Graphire tablet lines for commercial designers, home users and the education market. As well, it really utilises Vista’s built-in tablet capabilities, says ANZ managing director David Spencer. The tablet works in Windows 2000, XP and Mac OS X. In Vista, Bamboo works with Microsoft Journal and One Note for note taking, pen ‘flicks’ or pen-gesture navigation and with Digital Ink in Office 2007. It can also substitute for a mouse. Spencer says Bamboo was customised for Vista in a number of ways and is aimed at a slightly less graphically-inclined user. 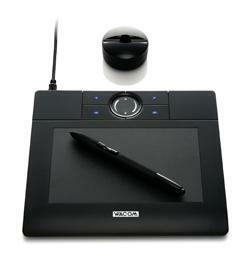 “It’s designed for a much wider audience than Wacom would traditionally be known for. It’s a more productive and effective computer interface and is absolutely mass market,” says Spencer. The Bamboo retails at $149.